I’ve been on a bit of a health kick lately. A few years ago, I lost 20 lbs and since then I have made no additional progress. I have started tracking my food intake again and have been making decent progress. I’m doing very well for breakfast and dinner but lunch is something I have been struggling with. I need something that will fill me up without using up all my calories for the day. While looking through the cabinets today, I saw a bag of quinoa. 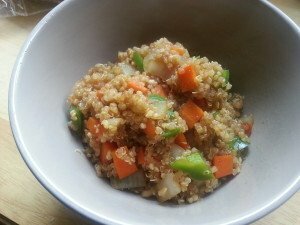 I have played with quinoa in the past, making various salad recipes but nothing really clicked. Looking at the bag today, I started to think about fried rice. I pulled together some ingredients, made the quinoa and started to cook. I was a little worried about the consistency of the quinoa. I really don’t like it cold but maybe hot would be better. Hot is definitely better. I didn’t miss the rice at all. The portion size was great and it really filled me up. I punched all the ingredients into the MyFitnessPal recipe generator and one serving is 267 calories. Yup, that’s right. I got a huge bowl of “fried rice” with only 267 calories. This my friends is a huge win for me. I will be making double batches of this in the future to reheat during the week. I think I found my new favorite lunch. Did I mention it’s quick? This recipe takes about 15 minutes to make, mostly because you are waiting for the quinoa to cook. Start the quinoa before dicing the vegetables. Don’t worry, you’ll have enough time while the quinoa cooks. If you wanted to bulk this up or make it for dinner, you could add some scrambled egg or meat to it. This dish is vegetarian. You can also change up the vegetables depending on what you have on hand. This recipe is great for using up little bits of things. I had carrots, peppers and onions so that is what I used. I used a bit of nonstick cooking spray in the skillet instead of oil to keep the calories down. In a small sauce pan, combine quinoa and water. Bring to a boil then cover and reduce to a simmer. Cook until the liquid is fully incorporated into the quinoa. While the quinoa is cooking, dice your vegetables. Spray a nonstick skillet with a bit of cooking spray and turn the heat to medium high. When the skillet is hot, add the carrot, onion and pepper. Saute, stirring frequently until the vegetables start to soften. This should take about 5-8 minutes. Add the garlic and turn down the heat to medium low. Stir in the garlic and cook until fragrant. It should only take about a minute. Your quinoa is now probably ready. Add the quinoa to the skillet, stirring to combine with the vegetables. Drizzle the hoisin and soy sauce over the top of the quinoa and stir to combine.